A degloving injury is where the skin and tissue of the hand are torn off, almost as if the skin is a glove that is removed. It is an avulsion-type injury, meaning that the skin and tissue are forcibly detached or torn away. The underlying structures (tendons, muscle, bone) in the hand are left intact. 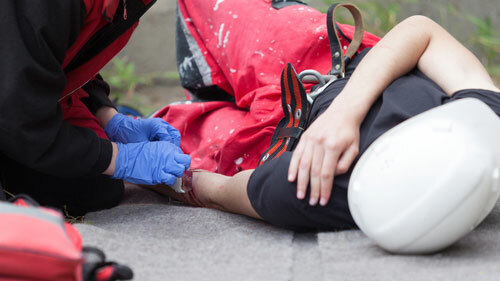 The injury mechanism involves the hand being caught and pulled at a low velocity. The main concern for treatment of a degloving injury is reconstruction and rehabilitation. Initially, wound coverage is the main concern. The exposed underlying structures of the hand must be covered as soon as possible so they do not necrose. Early motion exercises are also important. Treatment depends on the severity of the injury, hand dominance, patient age, and occupation. If the skin from the hand is available and still viable, the best treatment option is to use that skin to cover the wound. This involves revascularization and/or replantation. However, if the skin is not viable, a surgical reconstruction is performed with a skin graft or skin flap. A skin flap is where a flap of skin, usually from the groin, thigh, or abdomen, is partially removed and the affected area of the hand covered with the flap so the skin heals over and around the injury. In more severe cases, a pocket in the abdomen can be cut and the entire hand inserted. A skin graft is where a piece of skin is completely removed or harvested from a different area of the body and used to cover the hand. These surgeries usually require secondary procedures to remove scars, thin skin flaps, and release and separate fingers. Amputation is another treatment option especially when a marginal finger (index or little finger) is involved. This is especially true for people who do not want to undergo multiple procedures or do not have the time for the reconstruction. Prognosis for a degloving injury depends on the severity of the injury, i.e. how much of skin is affected (forearm, palm of hand, back of hand, fingers), how quickly the injury is treated, and whether the skin is still viable. The severity and treatment affect the movement and function of the hand. Hand therapy can be used to minimize scarring and stiffness in the hand. Therapy can involve scar massage and compression garments to soften scars, splints and mobilization, and occupational assessment to determine range of use. Additional surgeries can continue to improve function and cosmetic appearance. Rosenfeld Injury Lawyers LLC has represented clients in life changing degloving cases involving industrial incidents as well as motor vehicle collisions. Our Chicago personal injury law firm uses an out of the box approach to hold negligent parties responsible to the fullest extent of the law in order to provide for our clients needs. If you have questions about your legal rights call our office today for a free, no obligation consultation.